Explore the ruined cellars, living quarters and tunnels of this 13th-century castle, which was once the most formidable stronghold in the Middle Rhine region. Visit Rheinfels Castle (Burg Rheinfels) to journey through the ruins of a magnificent fortress that dates back over 700 years. Uncover the ancient history of both the castle and Sankt Goar via exhibits in the castle museum. Count Diether V. von Katzenelnbogen established Rheinfels Castle in 1245 as a hideout for Sankt Goar’s tax collectors. It passed to the House of Hesse in 1479 and then to the French revolutionary army in 1794 before Napoleon inflicted major damage at the end of the 18th century. Enter via the wooden door of the castle’s clock tower and follow the stone paths that traverse the ruins. Pass through a maze of casemates, courtyards and tunnels. Look inside former banquet halls, bedrooms and entertainment salons. Feel dwarfed while standing inside the enormous vaulted cellar. Climb up onto the ramparts and enjoy panoramic views of the picturesque Rhine Valley countryside. Gaze down on the town of Sankt Goar and across the Rhine River to Sankt Goarshausen. Watch as canoes, cargo ships, passenger ferries and sailboats cruise along the calm water. Browse the exhibits in the castle museum in the old chapel. Spot antique coins, ceramics and a scale model of the castle’s appearance in its heyday. Find examples of a bookbindery, tools and machinery from a fret sawmill. See a reconstruction of the Rheinfelsapotheke, a pharmacy built in Sankt Goar in 1598. The castle stands on a hilltop above the northern side of Sankt Goar’s town center. Walk here in 15 minutes from the town’s train station. Pay to park if you are arriving by car. Check to see if the Castle Express toy train connecting the castle and town center is operating. Rheinfels Castle is open daily from March to November and has an admission fee. During the rest of the year it is open on weekends only for pre-booked guided tours. The fee includes a trail map of the castle. Visit the official website of Sankt Goar for more information about guided tours and medieval festivals. Bring comfortable walking shoes and a flashlight for exploring the ruins. Admire great views of the Rhine River, learn about ancient legends, watch shows at an open-air theater and have fun on a summer toboggan ride at this striking headland. 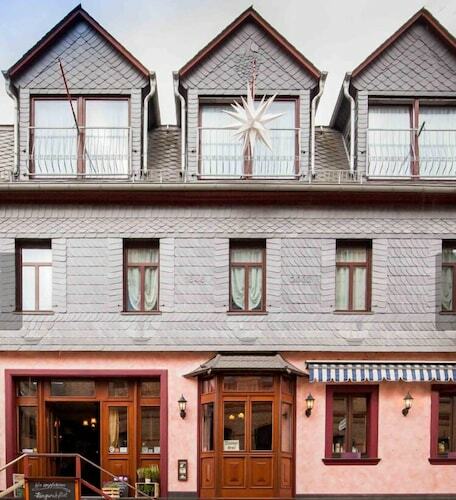 Situated in Sankt Goar, this spa hotel is 0.1 mi (0.1 km) from Rheinfels Castle and 2.5 mi (4 km) from Loreley. Pfalzgrafenstein Castle and Bluecher Museum Kaub are also within 9 mi (15 km). St. Goar Station is 12 minutes by foot and St. Goar KD is 13 minutes. 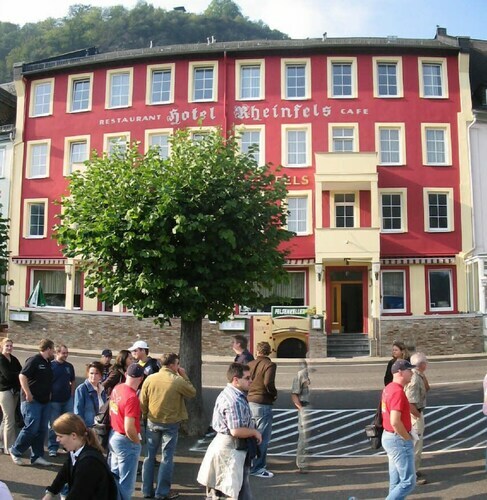 Situated in Sankt Goarshausen, this inn is 1.1 mi (1.7 km) from Rheinfels Castle and 1.5 mi (2.4 km) from Loreley. Bluecher Museum Kaub and Pfalzgrafenstein Castle are also within 9 mi (15 km). St. Goarshausen KD is only a 2-minute walk and St. Goarshausen Station is 5 minutes. 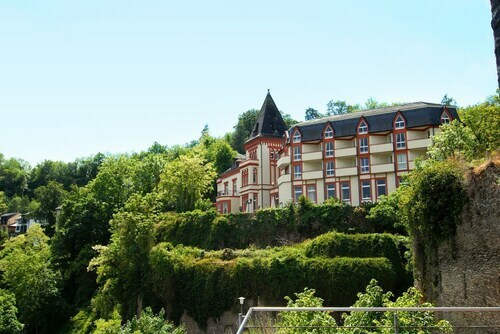 Situated in Sankt Goarshausen, this hotel is 1.1 mi (1.8 km) from Rheinfels Castle and 1.5 mi (2.5 km) from Loreley. Bluecher Museum Kaub and Pfalzgrafenstein Castle are also within 9 mi (15 km). St. Goarshausen KD and St. Goarshausen Station are within a 5-minute walk. 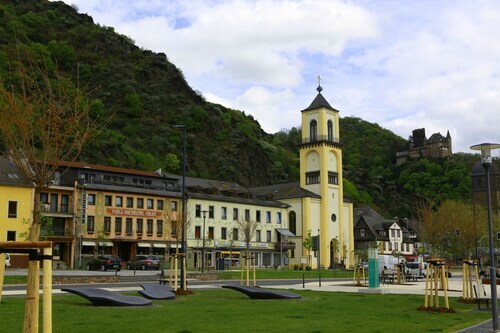 This family-friendly Sankt Goar resort is located on the waterfront, within 3 mi (5 km) of Rheinfels Castle and Loreley. Bluecher Museum Kaub and Pfalzgrafenstein Castle are also within 9 mi (15 km). St. Goar Station is 11 minutes by foot and St. Goar KD is 14 minutes. 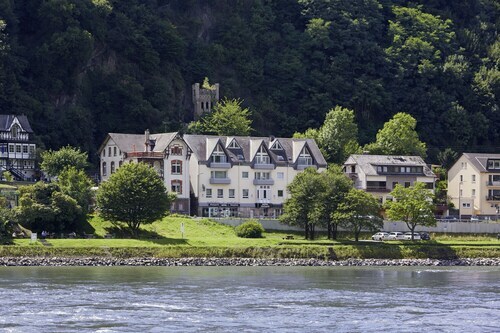 Situated on a river, this hotel is 0.6 mi (1 km) from Rheinfels Castle and 1.9 mi (3.1 km) from Loreley. Pfalzgrafenstein Castle and Bluecher Museum Kaub are also within 9 mi (15 km). St. Goar KD is only a 2-minute walk and St. Goar Station is 3 minutes. 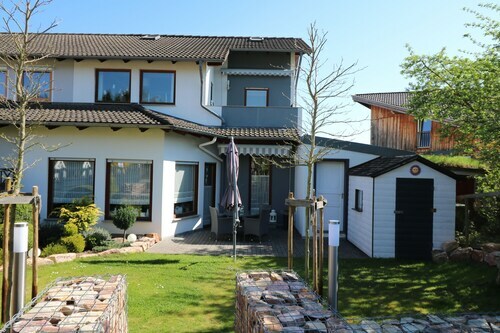 Situated in Sankt Goarshausen, this vacation home is 1.9 mi (3.1 km) from Rheinfels Castle and 2.3 mi (3.8 km) from Loreley. Bluecher Museum Kaub and Pfalzgrafenstein Castle are also within 9 mi (15 km). St. Goarshausen Station is 13 minutes by foot and St. Goarshausen KD is 19 minutes. Situated near the airport, in the city center, this hotel is in the same area as Loreley, Rheinfels Castle, and Pfalzgrafenstein Castle. Regional attractions also include Mittelrhein Klettersteig and Marksburg Castle.